The MacKay Branch was the former home of Anna C. MacKay, a librarian in Chelmsford from 1906-1924. It was given to the Town of Chelmsford in 1947 by her brother, Stewart MacKay, to be used in Anna’s honor as a library serving the residents of North Chelmsford – which the MacKay Branch has been doing enthusiastically ever since! 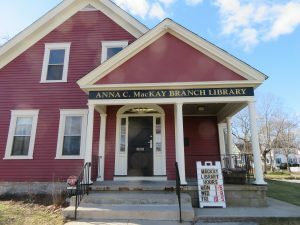 Read more about the history of Anna C. MacKay and the MacKay Branch [pdf].